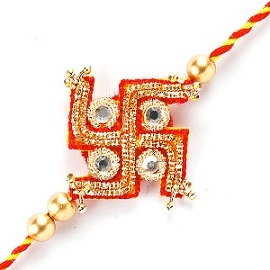 Raksha Bandhan is an Indian festival to celebrate love and duty between brothers and sisters. It is observed in the full moon day of the Hindu month of Shraavan . Shraavan is considered as a holy month, as many Hindu festivals like Krishna Janmashtami, Narali Poornima, Naga panchami, Basava Panchami, Avani Avittam and Pavithra Ekadashi falls on this month. Brahmins conduct their Upakarma ceremony on the full moon day in Shravan. This is the day Santhoshima emerged from the divine flames created by Ganapathi’s wives Ridhi and Siddhi. This day is celebrated as Nariyal Purnima in Maharashtra, fishermen offering coconuts as a mark of gratitude to Varuna, Lord of the Oceans. 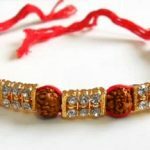 Raksha Bandhan celebrates brother – sister relationship not necessarily between biologically connected but also between those who wish to maintain such a relationship. 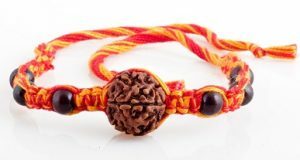 On this day, sister ties a rakhi on her brother’s wrist with prayers for his wellbeing and in return brother gives her a token gift and promises to protect her. 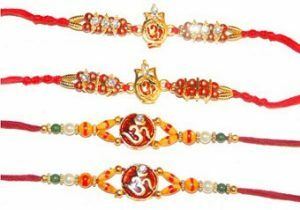 There are many tales behind Raksha bandhan but a common sense approach takes us to conclude it as an evolved festival. 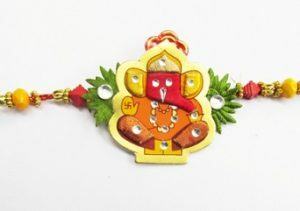 It is an ancient Indian custom to tie amulets for protection from evil. 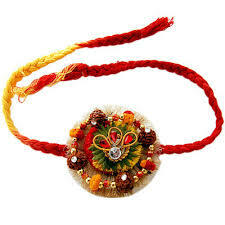 Tying Rakhi probably evolved from this tradition. 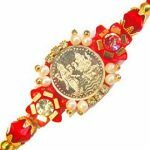 Though it is difficult to check the authenticity, it is believed that, Roxana, wife of Alexander the Great, sent a Rakhi to King Porus, requesting him not to harm her husband in the battle. History says, King Puru honoured the request. 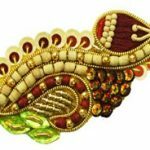 Another historical incident associated with Rakshabandhan is that of the Queen of Chittoor, Karnavati. 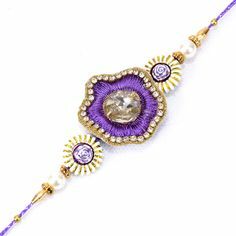 When Bahadur Shah of Gujarat attacked Chittoor, Karnavati sent a Rakhi to Mugal Emperor Humayun seeking his help. Touched deeply by it, Humayun rushed for her protection. But by the time he reached there, all women of Chittoor fort took their own life to save their honour. In 1905, Rabindranath Tagore took Rakhi celebrations to an entirely different level. When the British decided to divide Bengal on religious grounds, Tagore initiated, Hindus and Muslims tying Rakhi , taking a pledge to protect each other. Mahabharata tells the story of Draupadi, wife of Pandavas . Sri Krishna injured his finger when he beheaded Sishupala with Sudarshana Chakra. 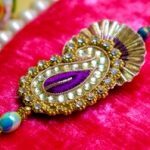 Draupadi rushed to bandage the bleeding finger, tearing a small piece from her Saree. Pleased by her token of affection, Sri Krishna promised to help her in time of need as a brother. 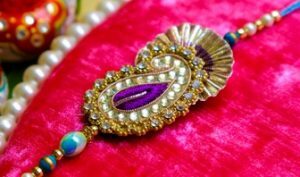 Krishna reciprocated by saving her honour when the Kauravas tried to disrobe her. 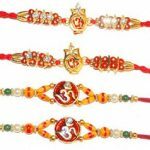 But many believe Raksha Bandhan originated from the story of Indra and Indrani. The King of the Devas, Indra was having a fierce battle with Asura, Vrita. Vrita was having an upper hand in the battle and Indra was facing defeat. Indra took the advice of Deva Guru Brahrispathi. 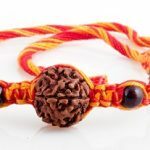 On the behest of Brahrispathi, Indrani, wife of Indra was asked to tie a thread around Indra’s wrist on the full moon day in the month of Shravana. With the power of the charm Indrani tied, Indra came victorious in the battle. The first things first – you should have the Rakhi ready before the Rakhi ceremony begins. 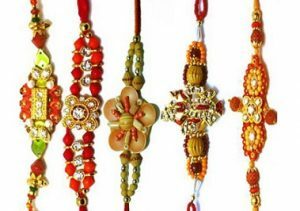 By July, most shops in India will start selling Rakhis of varying designs and materials. In Australia you can purchase it from most Indian shops, especially the ones owned by North Indians. On the day, sisters take bath early in the morning and wear colourful dresses. 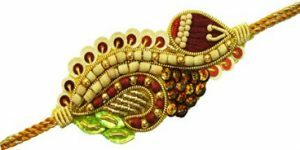 A Thilak Thali also known as Arthi plate (A plate containing materials for thilak ceremony) is prepared. 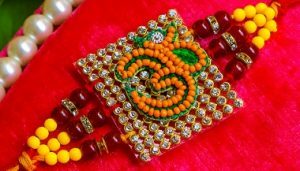 Thilak Thali usually have tilak made of saffron and sandalwood paste, Rakhi, some sweets, an earthen lamp and rice grains coloured with vermillion. Sister offers prayer for the wellbeing of brother. 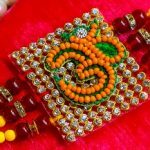 After tying the Rakhi , sister applies tilak on brother’s forehead, and offers him sweets. 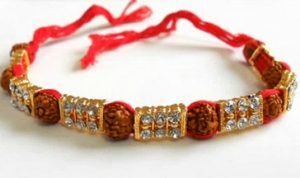 Brother is supposed to keep the sister happy by giving her a token gift in the form of money, jewellery or clothing. 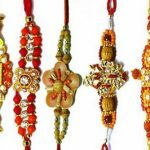 As per Drikpanchang website, the best time to tie Rakhi is during the Aparahna which is late afternoon according to the Hindu division of the day. If Aparahna time is not convenient then Pradosh time is also suitable to perform rituals. 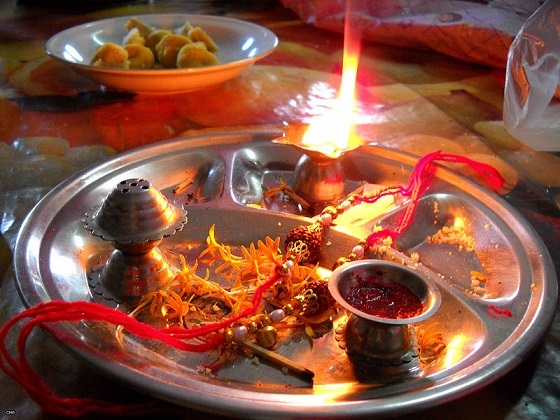 Raksha Bandhan rituals should not be done during Bhadra kaal. Bhadra is malicious time Hindu texts advises to avoid for auspicious work. 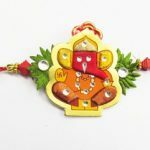 This Mantra is based on the story of King Maha Bali who was sent to nether lands ( Pathala which is underground ) by Lord Vishnu in his Vamana Avatara. Vishnu disguised himself as Bali’s doorman to protect the King in nether lands from his enemies. Goddess Lakshmi felt lonely at Vaikunda in the absence of Lord Vishnu. She descended to Pathala disguised as a Brahmin woman to bring back her husband. She requested Bali for a place to stay until her husband who has gone away for a long errand returns. Bali welcomed her wholeheartedly. On Rakshabandhan day Goddess Lakshmi tied Rakhi on Bali’s wrist and prayed for his wellbeing. Touched by her actions, Bali granted her a wish and Goddess Lakshmi requested Bali to return her husband. Bali fulfilled her wish by asking Vishnu to go back with Goddess Lakshmi to Vaikunda. Rakhi can come in many shapes and forms. 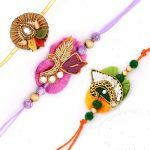 You will find many online shops selling designer Rakhis. 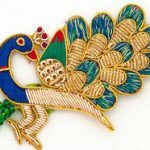 It can even be a simple thread or can be with intricate designs and decorations. 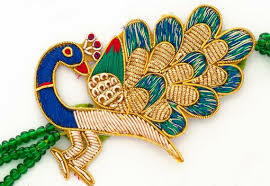 The most common design is one with colorful woven thread. What ultimately matters is your love for your brother and vice versa. Have you been to the Melbourne Star?